The holidays are upon us and you may be looking for that “special something” to give as a gift. 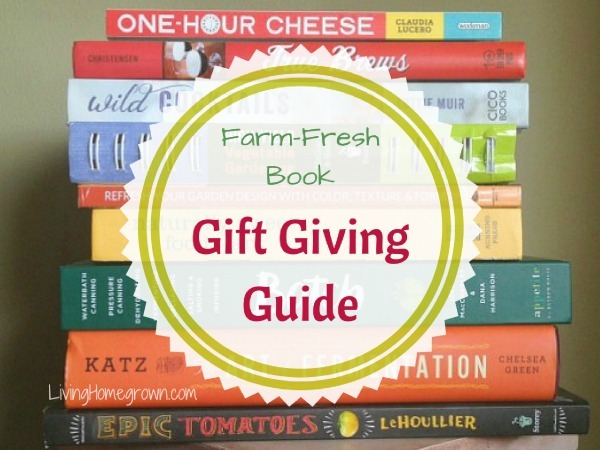 Why not give a book that will help the recipient live a farm-fresh lifestyle? I love to give and receive books because they are actually the gift of transformation. Many times they start a journey for the reader that can be life-changing. Who doesn’t want that, right? I put together a listing of my favorite books that can help someone take one more step into a farm-fresh life. This journey can be a gift you give away or you buy for yourself. Just share the link as your wish list! Each of the following books are EXCEPTIONAL. No fluff. They are filled with solid information and inspiration that is simply packaged into a book form. Some of these books are new, others were published in previous years. But ALL are among my favorites. To be honest, it was hard to narrow down the list to just nine. There were about 10 others I wanted to include! But I needed to keep the list manageable so as not to overwhelm you. This list is a good start. Some of the authors have been interviewed on the Living Homegrown Podcast. So if you want to hear more about their books and their work, I’ve included links to the respective episodes below. One Hour Cheese* is perfect for our busy lives. 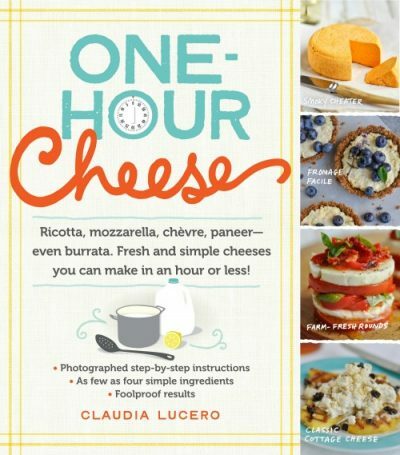 All the homemade cheese recipes in this book take one hour or less. Clear instructions and excellent photographs walk you through every step of 16 different homemade cheeses. If you want to test it out, I featured Claudia in Episode #72 where she taught the listeners how to make a simple cheese with no special equipment. It’s delicious and easy to do. 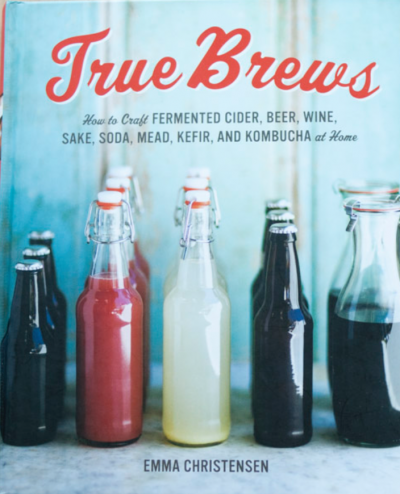 We are going to be exploring a lot more fermented beverages in 2017 and if you are looking to just get started in this area, I recommend True Brews*. Emma is a brew queen having written about everything from beer to kombucha both online and in her books. This particular book covers a wide range of handcrafted, fermented drinks including cider, beer, wine, mead and more. 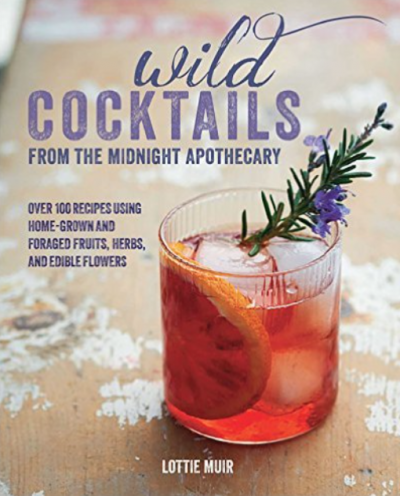 Wild Cocktails* contains over 100 recipes using homegrown and foraged fruits, herbs and edible flowers. I like that she dives into making infusions, syrups, bitters and liqueurs as well as cocktails. It’s a fun read. 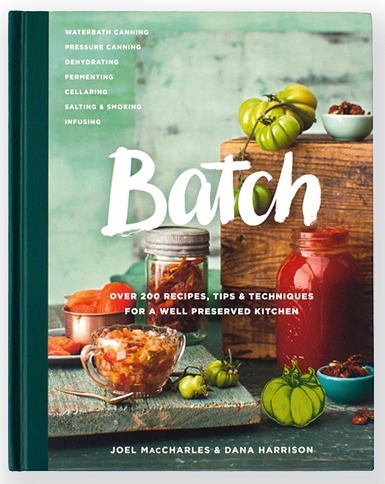 Batch* is one of my all-time favorite preserving books. It covers over 200 recipes but includes tips and techniques for a well preserved kitchen. I love Joel and Dana because they are fun and their information is top-notch. You can hear their enthusiasm in a two-part interview (Episode 57 and Episode 58) where they share several simple recipes that you can try at home. The Art of Fermentation* is a classic. And like all good classics it covers a lot of material in-depth. 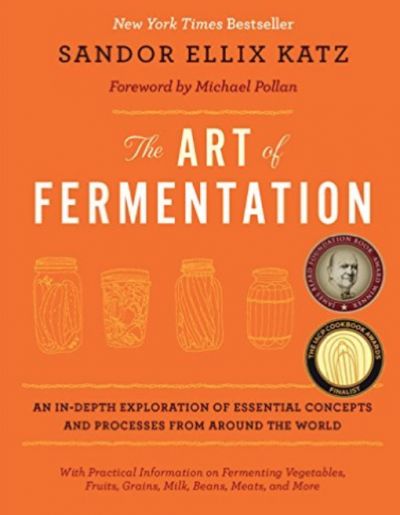 I feel it is a must have book for anyone wanting to really dive deep into the science of fermentation because Sandor is the master in this field. He goes into the history, the concepts and the processes behind all types of fermenting. Great for science-geek types like me. If you want to learn more about fermentation, I’ve covered it on several episodes of the podcast. Check out Episode 39, Episode 28 or Episode 6. Everything Marisa does is top-notch. Her recipes always work and she teaches solid methods. That’s why I love her books. But I am especially fond of this one, Naturally Sweet Food in Jars*. Why? Because I teach a lot about low and no-sugar canning inside my Canning Academy. 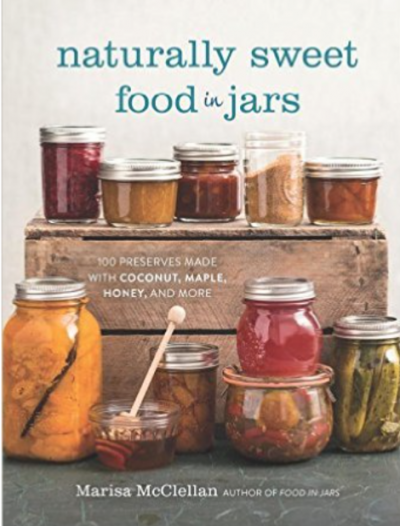 But in this book, Marisa covers how you can still sweeten your preserves without refined sugar by using more natural sugars like coconut, maple, honey and more. And she did a heck of a lot of research in a previously unexplored area to be sure that all of her recipes would work as well as traditional ones do. It is an excellent primer on this topic if you wish to shy away from refined sugar but still keep your preserves sweetened. I first had the pleasure of hearing Craig speak at garden show last year and I was hooked! Craig is someone who lives and breathes tomatoes with a passion beyond anyone I know. 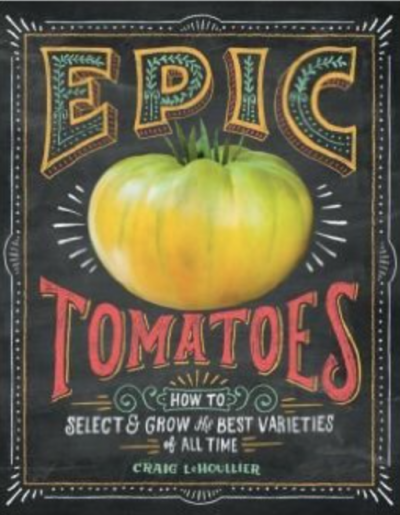 His book, Epic Tomatoes*, not only shows you how to select and grow the best tomato varieties of all time, but it is also incredibly inspiring. You can’t read it without your mouth-watering at the descriptions and his enthusiasm. 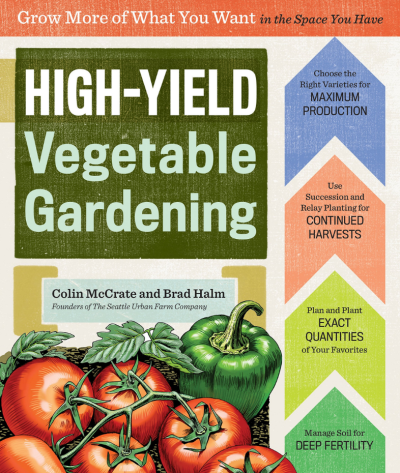 High Yield Vegetable Gardening* shows you how to get MORE from your small space. Filled with powerful farming techniques that are scaled down to be used in our own backyards, you will find a wealth of info here. From preparing the soil to rotating the crops and creating customized planting/record-keeping charts, you learn all the tricks of growing just the right amount of food for your small-space situation. In Episode 56 Colin shares many of the tips inside the book. Give it a listen if you missed it earlier. It doesn’t matter if you grow food, flowers or something else — Many of us want to give our gardens a facelift but are unsure where to start. Refresh Your Garden Design* is your roadmap. 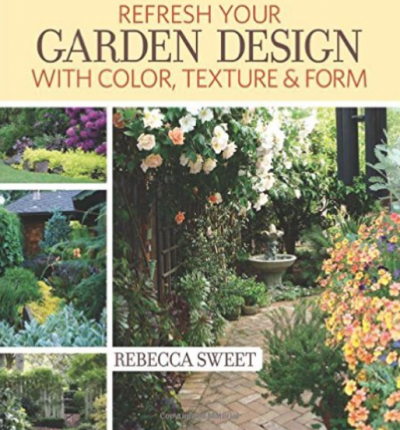 Rebecca is an acclaimed landscape designer who walks you through a simple process for taking an existing garden and transforming it to a professionally designed landscape…all by yourself. She breaks down design concepts into easy-to-follow procedures so that your garden looks like it was done by professional – without the professional cost. Rebecca shares many do-it-yourself tips in Episode 71 that give you a taste of what is covered in more depth inside the book. Many of the links, images and * links in this post are affiliate links to help cover the cost of running this blog. I always enjoy your information. Thank you for taking the time to share. Best wishes for a happy and productive new year! Hi I bought a used yogurt maker. Do you have courses on how to make yogurt? No I don’t have any courses on making yogurt. But I think you will find it isn’t too difficult. I recommend you try culturesforhealth.com for yogurt cultures. They have very good instructions there on how to do it. Have fun!